You Are Here: Home / Editorials / Energy Savings - Cool Roofs / Featured / Perm Rating / Roof Repairs / SureSet / The science behind our single-ply roof systems / Uncategorized / Waterproof your Winter / Waterproofing / Ready to Boost Your Business 25% This Winter? Ask any contractor, and they will tell you the best time to roof is when the sun is shining, there is no threat of rain, and the temperature is moderate or just right. Sure, there are plenty of those days, but how do you handle the rest, when the weather isn’t so great? Especially in the winter when there is cool, damp weather. 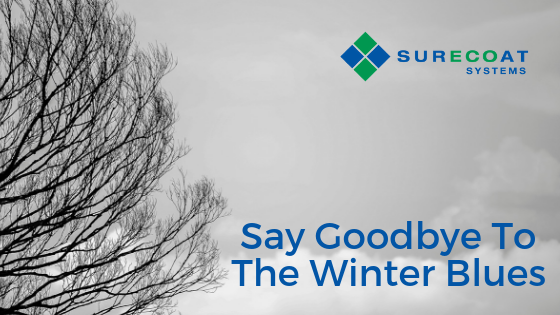 Roofing in any area across the U.S. during the winter comes with its own seasonal risks, but what if we told you that you could comfortably roof all year round? As common sense will tell you, you can’t roof while it’s raining on you or if it is below freezing but you can roof up until the day before depending on the temperature, here’s how – SureSet. What the Heck is SureSet? SureSet is a quick dry coating used to embed high strength Poly-Mesh for waterproofing of flat and low-sloped roofing membranes in low temperatures, and within reason, inclement weather. SureSet is engineered with the same high-grade raw materials and waterproofing abilities as other SureCoat roof coatings but is fast drying and cures within 2-12 hours when applied in temperatures as low as 40°F. 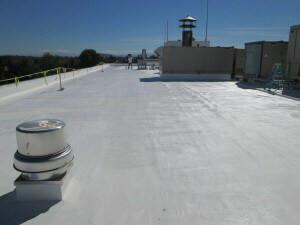 The installation of our quick-dry roof coating couldn’t be more straightforward. 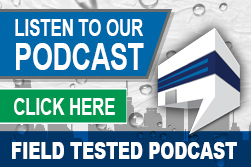 In less than three minutes, we will show you how to complete a waterproof flat roof repair using SureSet, our fast drying roof coating for flat roof repairs in colder weather. Click here to view our install video. SureSet eliminates the need for multiple repair trips, alleviates the worry and hassle of temperature restrictions and unexpected weather that prohibit the use of traditional roof coatings. And, quick-set technology saves on roofing labor and downtime. SureSet was designed to have high strength, stick like crazy, be seamless and act as a quick-dry base coat used to attack the most vulnerable roofing issues now. Used in combination with the regular SureCoat product, it is waterproof and cool roof rated once SureSet is top-coated with SureCoat. Want to learn even more about the science behind SureSet? Are you ready to boost your business 25% this winter? Call us at 877-8 BE SURE (823-7872) or email us at info@surecoatsystems.com to get started.